Once every four years a worldwide football event is held - FIFA World Cup that is comparable to the Olympic Games. Today let's briefly explain some information about the World Cup. Above all, the FIFA World Cup often simply called the World Cup is an international association football competition contested by the senior men's national teams of the members of the International Federation of Association Football (FIFA) which is the sport's global governing body. The championship has been awarded every four years since the inaugural tournament in 1930, except in 1942 and 1946 when it was not held because of the Second World War. The current champion is Germany that won its fourth title at the 2014 tournament in Brazil. 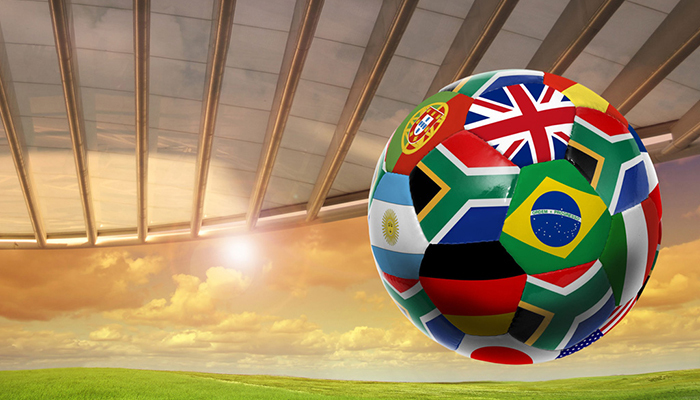 The 20 World Cup tournaments have been won by eight national teams. Brazil has won five times and they are the only team to have played in every tournament. The other World Cup winners are Germany and Italy with four titles each; Argentina and inaugural winner Uruguay with two titles each; and England, France, and Spain with one title each. In 2018, the 21st FIFA World Cup is held by Russia from 14 June to 15 July in 11 different cities. It seems that the World Cup is popular all over the world nowadays as it had an estimated 715.1 million people watch the final match in 2006. The holding of the first World Cup competition was not that easy or even was held after overcoming large numbers of difficulties and obstacles. Due to the success of the Olympic football tournaments, FIFA with President Jules Rimet as the driving force again started looking at staging its own international tournament outside of the Olympics. On 28 May 1928, the FIFA Congress in Amsterdam decided to stage a world championship itself. With Uruguay now two-time official football world champions and to celebrate their centenary of independence in 1930, FIFA named Uruguay as the host country of the inaugural World Cup tournament. The national associations of selected nations were invited to send a team, but the choice of Uruguay as a venue for the competition meant a long and costly trip across the Atlantic Ocean for European sides. Indeed, no European country pledged to send a team until two months before the start of the competition. Rimet eventually persuaded teams from Belgium, France, Romania, and Yugoslavia to make the trip. In total, 13 nations took part: seven from South America, four from Europe and two from North America. In the final, Uruguay defeated Argentina 4-2 in front of a crowd of 93,000 people in Montevideo, and in doing so became the first nation to win the World Cup. As the inaugural winner, Uruguay national football team represents Uruguay in international association football and is controlled by the Uruguayan Football Association, the governing body for football in Uruguay. Besides the winning of the first World Cup in 1930 as hosts, they won their second title in 1950 defeating host Brazil 2-1 in the final match. 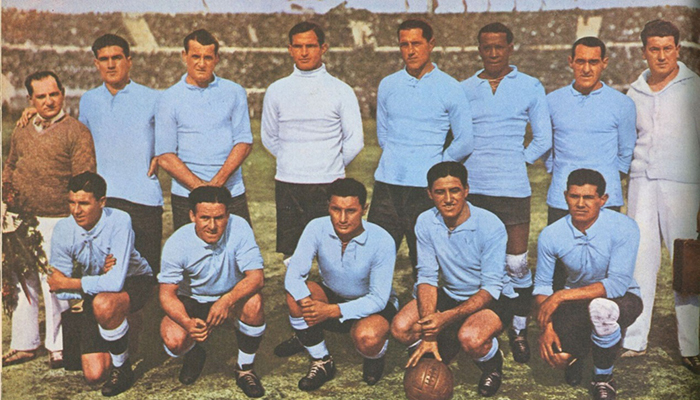 Another unique achievement of the Uruguay football team is that it is the national football team gained the most national championships above the continent and has won 20 world-class and continent-level official football matches. In the 2014 World Cup, Uruguay was in Group D competing with Italy, England and Costa Rica which was called the veritable death group. In the first match of Group D, due to the absence of Luis Suárez, the Uruguay team lost 1-0 to Costa Rica under the situation with a lead. In the second game, with the excellent performance of an injured Suárez, he scored two goals so that Uruguay beat England 2-1 chasing Italy with the same score. In the third, Uruguay scored a 1-0 to Italy and advanced to the top 16, but because of the absence of Suárez again in the 16th knockout round, the Uruguay team lost 0-2 to the Colombian team which ended the Brazilian World Cup. On 2 June 2018, Uruguay announced the final list of 23 people participating in the World Cup. Luis Suarez and Edinson Cavani took the lead of Uruguay team. Goal Keeper: Femando Muslera, Martin Campana, Martin Silva. Defender: Jose Gimenez, Diego Godin, Guillemo Varela, Gaston Silva, Maxi Pereira, Sebastian Coates, Martin Caceres. Midfielder: Matias Vecino, Diego Laxalt, Carlos Sanchez, Rodrigo Bentancur, Cristian Rodriguez, Nahitan Nandez, Giorgian De Arrascaeta, Lucas Torreira, Jonathan Urreta. Striker: Luis Suárez, Cristhian Stuani, Maxi Gomez, Edinson Cavani. 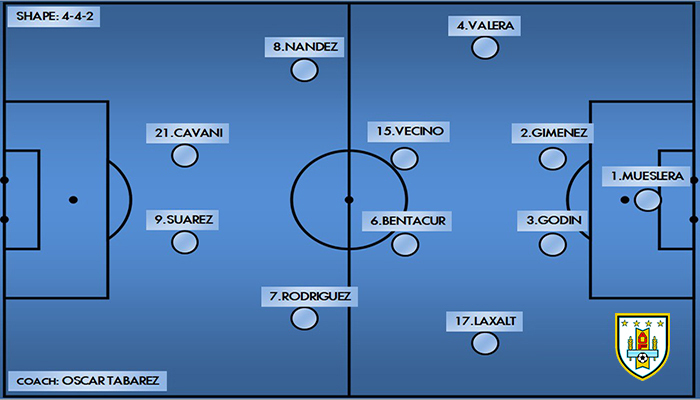 At 2018 Russia FIFA World Cup in the 4-4-2 formation that Coach Oscar Tabarez made for Uruguay team the combination of double strikers Suárez and Cavani are gorgeous which makes them have more opportunity to advance to the top 16. Luis Suárez is Uruguay's all-time leading goal scorer. At the 2010 FIFA World Cup, he played an important role in Uruguay's fourth-place finish scoring three goals as well as controversially blocking a goal-bound extra time header with his hands during the quarter-final against Ghana. At the 2011 Copa América, Suárez scored four goals as Uruguay won a record fifteenth Copa América, and he was named Player of the Tournament. At the 2014 FIFA World Cup in Brazil, Suárez scored his 40th international goal. 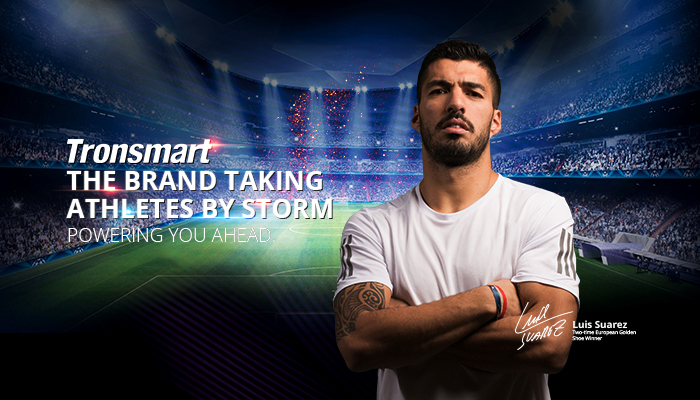 Convinced by Suárez outstanding football performance in the year of the FIFA World Cup, Tronsmart sincerely invited him to become our brand official ambassador. Suárez has been deemed “the perfect fit” for Tronsmart due to shared values and motivations. Tronsmart has a diverse line of products equipped with top-notch features that enrich the lives of their customers. The 2018 FIFA World Cup is a great challenge ahead for Suárez and his team. Tronsmart has been able to overcome many challenges and deliver impeccable products for all consumers. In order to celebrate Suárez to be part of Tronsmart In 2018, we customized a Tronsmart Mega Limited Edition Bluetooth Speaker that is equipped with a powerful 40W output providing high fidelity stereo sound. At the 2018 FIFA World Cup, we are looking forward to the outstanding performance of Suárez in the match. In the end, Tronsmart sincerely invites all football fans from all over the world to shout and cheer for your favorite team. 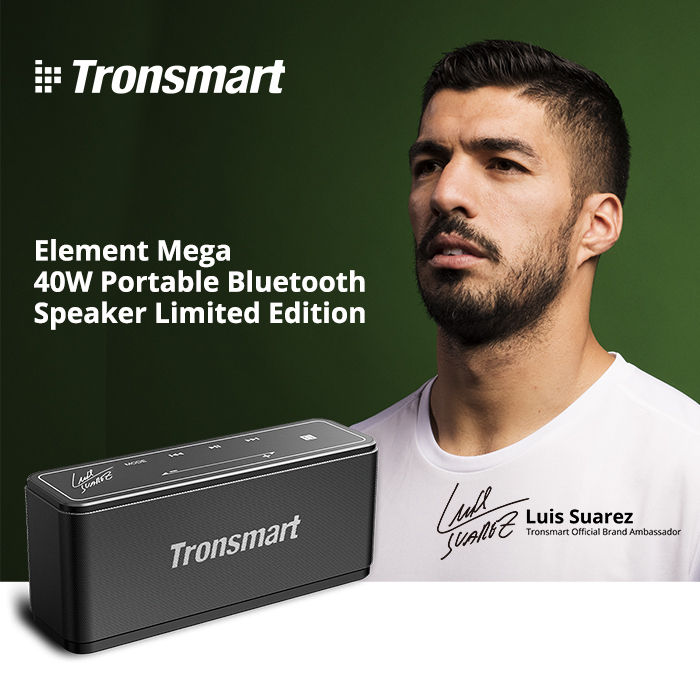 Related: Celebrate FIFA World Cup with Luis Suarez and win Suarez Limited Edition Bluetooth Speaker at Tronsmart activity here.